What are the Duties of Corporate Directors? | Denton Peterson P.C. Home > Blog > What are the Duties of Corporate Directors? In a corporation, the body in charge of running the corporation is called the board of directors. The board of directors has many responsibilities. Under certain circumstances, shareholders may initiate lawsuits against the board of directors for some of its decisions. Lawsuits may also arise because there are allegations that the board of directors has not performed up to the expectations of the shareholders. Ultimately such suits often revolve around one main question: What are the duties of corporate directors? The answer, like many others in the law, is not so straightforward. Different courts have taken different approaches in different situations regarding what the duties of corporate directors should be. One approach courts have taken in the past is to not interfere with the decisions of corporate officers unless there is evidence of fraud or dishonesty. For example, in one case a corporation bought stock for nearly $30 million and the stock’s market value increased by about $4 million. The directors in this case chose to issue a special dividend instead of selling the stock on the open market. The plaintiffs in this suit alleged that selling the stock would have saved the corporation millions of dollars in tax money. Although in this case the court seemed to indicate that this may have been a financially unwise decision, this was not enough to rule for plaintiffs. Instead, the court simply said that in this type of situation, the court will “not interfere unless the powers have been illegally or unconscientiously executed; or unless it be made to appear that the acts were fraudulent or collusive, and destructive of the rights of the equity interference, for the powers of those entrusted with corporate management are largely discretionary.” The court here found no evidence of fraud or dishonesty (see Kamin v. Am. Express Co.). There are still more specific duties of corporate directors. The Court in Francis v. United Jersey Bank goes over some of these more specific duties. Corporate directors have some duty of competence, to be knowledgeable and competent enough to make reasonable decisions on behalf of the corporation. For example, in Francis v. United Jersey Bank, the court stated that as a general rule, a director should acquire at least a “rudimentary understanding of the business of the corporation.” Although having a rudimentary understanding of the business of the corporation is a low standard for directors, it is still a duty that courts have expressed lay on the directors of the corporation. There are still other duties of directors that were described in Francis v. United Jersey Bank. Another duty is the duty to keep informed about the activities of the corporation. This implies that directors should not only possess knowledge of the business itself, but should keep themselves informed as to what is occurring with the corporation. The subtle difference between the two is important. While one duty is a duty to be aware, overall, of what the business is and does, the other involves being aware of new developments within the corporation. Another duty of directors is that they may not “shut their eyes to corporate misconduct.” Even if it may be profitable or beneficial to the corporation for the directors to avoid confronting misconduct, one of the legal duties of directors is to confront it. This means directors should take action against misconduct if they observe it. That is, directors have a duty to object if they discover there has been illegal action or to resign if this is not corrected. In addition, a director has a duty to take reasonable means to prevent illegal conduct by co-directors. Misconduct at all levels is not to be tolerated by directors. The directors also have a duty in many cases to “maintain familiarity with the financial status of the corporation by a regular review of financial statements.” This is a specific duty which requires the directors to keep informed about the activities of the corporation, more particularly on the financial aspects of the corporation. How detailed that knowledge needs to be depends on the circumstances. In addition to understanding the finances of the corporation, a director also has a duty to “exercise reasonable supervision and control over the policies and practices of a corporation.” This means that directors are ensuring that policies and practices of the corporation are legal and beneficial to the corporation in general. The directors of a corporation have certain general and specific legal duties. In Arizona the basic standard is for a director to act as an ordinary reasonable person would in similar circumstances. The standard of the duties of directors of a corporation is general and is open to courts making their own determinations of whether particular actions on the part of directors of a corporation were a violation of their legal duty. Often courts will simply defer to the judgment of the board of directors and this makes it difficult for individuals to prevail in a lawsuit against directors of a corporation. Given the complex nature of this area of law, it is best to consult with a competent business law attorney in regards to your particular situation. 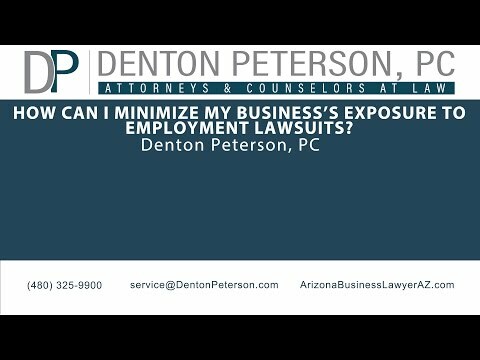 Call the business law attorney at Denton Peterson, P.C. to receive advice concerning your particular situation. Kamin v. Am. Express Co., 383 N.Y.S.2d 807, 810 (N.Y. Sup. Ct. 1976). Francis v. United Jersey Bank, 87 N.J. 15, 30-32 (1981).